At this point, it’s likely you’ve already completed form FL-100, which is the petition, and FL-110, the summons. 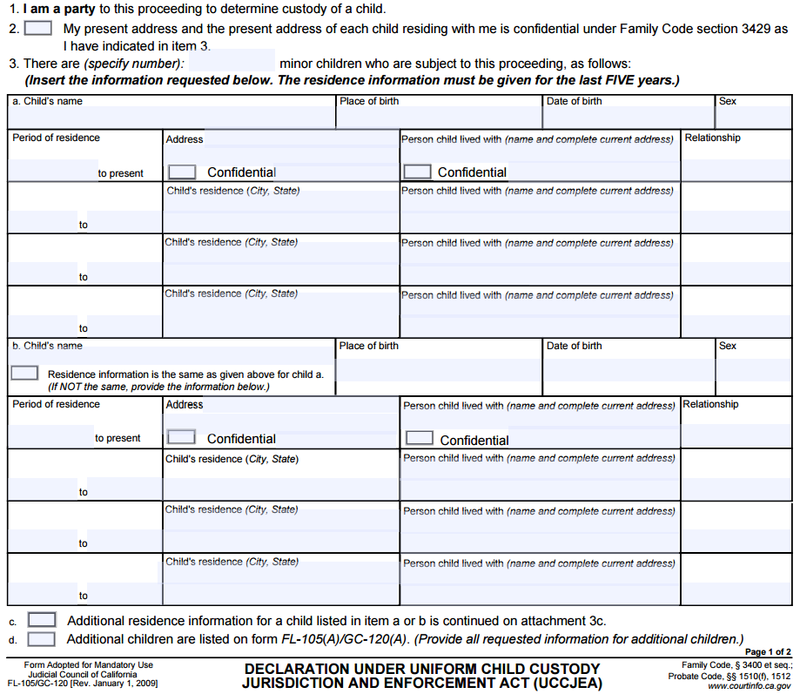 Again, if you have minor children of the marriage, you’re going to complete FL-105 which is the declaration called, “The Uniform Child Custody Jurisdiction and Enforcement Act” or “UCCJEA” (abbreviated due to its very long name). The UCCJEA applies to children of the marriage, and to recap, a child of the marriage would be a child who is biologically yours and your spouse’s (the petitioner and respondent). Additionally, any child or children that were adopted during the marriage fall into this category as well. We’re always going to refer to this form, FL-105, as the UCCJEA because the actual title is very long, and this form itself hasn’t changed since 2014. We’re going to be using the video series from 2014 to walk through this form, but what I’d like you to remember as with the prior two forms, FL-100 and FL-110, is to keep the captions the same and use what you’ve learned so far with the video series from 2015. Now this is where you’re going to need some knowledge of your particular courthouse. Contra Costa county, for example, requires this document be attached to your petition (form FL-100). Other counties such as Solano county want them to be 2 separate documents. Every county is a little bit different. Alameda county doesn’t care – you can put it all together, or you can leave it separate. This is definitely a county-specific thing, and you’ll want to make sure you know how to bring your papers to the courthouse. Feel free to contact us, or you can call the court directly for information on what they require. The UCCJEA (FL-105) if you have minor children of your relationship. These are the 3 documents you need to bring down to the courthouse to start the divorce process. Our next article in the series is going to be FL-115, the proof of service of summons. This form applies after you file for divorce and serve your spouse.